Some of my residents love crafting but find it overwhelmingly difficult. 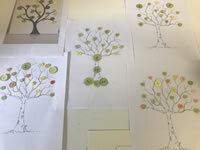 With the tree already printed out I had to put the glue down for some, where others just did it all but the picking up and placing of buttons was the fine motor skills being used and the conversations re Autumn and then looking outside and connecting the activity to the environment we were in all made for a therapeutic yet creative craft afternoon. Beautiful Jeannette, thanks so much for sharing pics! 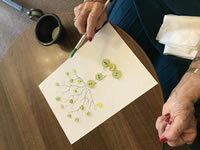 Am planning an Autumn themed programme and there was the idea for creative button trees, just perfect. All that fun of painting the trees and tree talk. I think many of us have button jars or our grandmothers' did, so I look forward to some lively conversation. Thanks so much for your feedback Kaz! These are fun, we made some last year with our group. 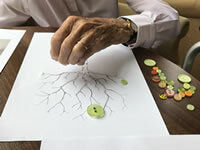 We used flat backed canvases so that is was easy for our clients to glue the buttons on. Great activity for any skill level! Great idea, thanks for sharing Karen!